UNCASVILLE, Conn. – June 10, 2016 – Barrett-Jackson, The World’s Greatest Collector Car Auction®, will feature many spectacular Ford-powered muscle cars during the inaugural Northeast Auction June 23-25, 2016, at Mohegan Sun. Among those set to cross the block include a rare, matching-numbers 1969 Ford Mustang Boss 429 (Lot #669) and an original, matching-numbers Highland Green 1968 Shelby GT500 KR (Lot #668). Highlighting the Ford power at Mohegan Sun is this outstanding, matching-numbers 1969 Ford Mustang Boss 429 (Lot #669) finished in Wimbledon White with Black Clarion vinyl/knit, high-back bucket seats. The nut-and-bolt rotisserie restoration was completed to the highest MCA concours standards and is fully documented with over 300 detailed photos. This car was ordered with a 429ci 4V Boss engine, 4-speed close-ratio manual gearbox, Traction-Lok differential and Visibility Group. It is a two-owner car that still includes the factory Build Sheet, manuals, brochures, warranty card, owner data plate and Marti Report. An original, matching-numbers 1968 Shelby GT500 KR (Lot #668) will also cross the auction block at Mohegan Sun. This Highland Green KR 4-speed convertible features the original matching-numbers motor and transmission as well as original sheet metal and fiberglass. This King of the Road was rotisserie-restored to concours condition by Shelby restoration professionals in Riverside, California, and features a Delux Marti Report as well as an original dealer invoice verifying this Shelby’s originality. Two rare Mustangs from the Wright Collection are also included in the docket of incredible vehicles set to cross the auction block. One is a 1970 Boss 302 Fastback (lot #625) never completely restored and still retaining most of the original sheet metal. Additionally, it is the only one equipped with this combination of options: yellow paint, black interior, 302 4V Boss engine, 4-speed wide-ratio manual transmission, tachometer, heavy-duty battery, sport deck rear seat, trim rings and hubcaps and 3.50 Traction-Lok rear axle. The second is a matching-numbers 1970 Ford Mustang Mach 1 428 CJ Fastback (Lot# 740). This Mustang is a very rare R-code car featuring the Cobra Jet version of the engine that was a favorite of NHRA competitors. The inaugural Northeast Auction at Mohegan Sun, June 23-25, will be broadcast live on Velocity and The Discovery Channel. 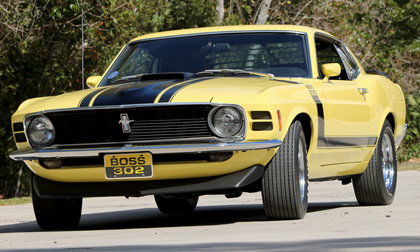 For more information on becoming a bidder, follow the link to http://www.Barrett-Jackson.com/Bidder/Home. Established in 1971 and headquartered in Scottsdale, Arizona, Barrett-Jackson, The World’s Greatest Collector Car Auctions®, is the leader in collector car auctions and automotive lifestyle events. The company produces auctions in Scottsdale, Arizona; Palm Beach, Florida; at Mohegan Sun in Connecticut, and Las Vegas, Nevada. With broadcast partners, Velocity and Discovery Channel, Barrett-Jackson will feature live television coverage in 2016, including broadcasts in over 100 countries internationally. Barrett-Jackson also endorses a one-of-a-kind collector car insurance for collector vehicles and other valued belongings. For more information about Barrett-Jackson, visit http://www.barrett-jackson.com,or call 480-421-6694.